This was received by Charter supporter, Diana Peters. Diana wrote this piece after see saw Gayle King being interviewed on the Charlie Rose Show. Since the conversation between King and Rose was on Maya Angelou, Diana decided to address this writing to Gayle King. The picture of Maya Angelou is not by Diana. Because I am grieving the loss of Maya Angelou and have no one to share the passing of a wonderful part of my life, I send it to you and hope you will read it. 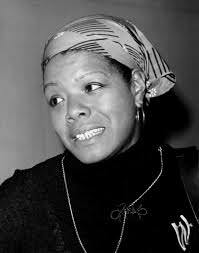 I met Maya Angelou in 1976 when an author friend of mine from Evanston, Illinois was coming out to California to interview her for a book he was working on. He was to be staying with my husband and I in Mill Valley. “You will need a driver to take you up to Boyse Hotsprings” where Maya was then living. I returned to her country hiding place at her invitation 2 more times to take many more photos, color and black & white, one of which has hung on my walls ever since. Also, on one of those photo shoots I met her son and later was privileged to photograph her mother. Two or three years ago Maya Angelou was speaking at the Paramount in Seattle which a friend of mine and I attended. I did so want to speak to her once more and I had the ushers tell me where I might be able to do that. Going to where they said, I ended up on the sidewalk near the stage entrance where she was being delivered in a wheel chair to her limousine. She spotted me, 38 years since we had last seen each other, and beckoned to me to come to her. We exchanged a few words....she asked, “do you live up here now? And do you like it?” and little else. But I was so happy that she remembered. Having known her is a highlight of my life. She is two years younger than me. And I shall miss her being no longer in this world but she is in my heart.